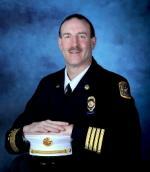 Fire Chief Ted Collas is a 32 year veteran of the Colorado Springs Fire Department. During his career Chief Collas has served the department as a Firefighter, Paramedic, Company Officer, Battalion Chief, and Deputy Fire Chief and has held positions in the operations, medical, and training divisions. From 2013 - 2016, he served as the Deputy Chief of Support Services, providing oversight to Facilities, Fleet Services, Human Resources, Medical and Training Divisions, Public Information, and Community and Public Health. He was sworn in as the CSFD Fire Chief on August 3, 2016. 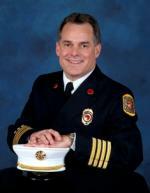 He was recognized as the CSFD Firefighter of the Year in 2003. Chief Collas holds an Associate of Science in Fire Science from Honolulu Community College, a Bachelor of Science in Management from Colorado Christian University, and a Master of Science in Organizational Leadership from Regis University. Chief Collas receives his greatest joy from spending time with his family and serving others through his church and other para-church organizations. He is a past president of the Board of Trustees for Casas por Cristo, an organization that builds homes for impoverished families in Mexico, Guatemala, and the Dominican Republic. Chief Dubay previously served as the City's Director of the Office of Emergency Management (OEM). Other previous assignments at the CSFD include Fire Prevention and Training. Outside of the CSFD, he formerly served as the president of the Board of Directors for the Woodland Park Ambulance Service (Woodland Park, CO) for five years. Chief Dubay is a twenty-seven year veteran of the fire service, having started his career in 1985 with the City of Casper (Wyoming) Fire Department. Steve has worked for the Colorado Springs Fire Department since 1988. 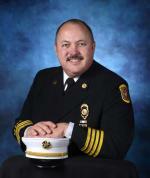 He is currently a Deputy Chief overseeing the Fire Operations Division. He is a Colorado state-certified and nationally registered Emergency Medical Technician-Paramedic, has completed a Bachelor of Science in Fire Service Administration and a Masters of Public Administration, and is a graduate of the National Fire Academy's Executive Fire Officer Program. Steve holds membership in the International Association of Fire Chiefs, the International Association of Fire Fighters, the National Fire Protection Association, and the American Society for Public Administration. Chief Royal has been a member of the Colorado Springs Fire Department for 29 years and, prior to assuming duties as a Deputy Chief in 2016, served as an operational Battalion Chief and the C Shift Commander. He has worked in emergency services for 39 years (28 years as a paramedic), having previously been involved with volunteer fire and private EMS agencies. Chief Royal graduated from Flagler College, has attended the National Fire Academy, and has earned the Executive Fire Officer designation. He has presented numerous classes in the state and region to include the Colorado State Chiefs Conference and Fire-Rescue International. During his career, he has been involved in the initiation of the Tactical Emergency Medical Program, worked in the early Hazmat and Tox-medic Programs, managed the Medical Division, and helped develop the Awards and Recognition Program. Fire Marshal Lacey is the Fire Marshal for the Colorado Springs Fire Department. He is a graduate of Oklahoma State University and is a registered professional engineer and a certified safety professional. He has worked in the fire service industry for over 36 years, serving in the ranks of firefighter, paramedic, and fire protection engineer up to his current position. He has also worked for Fire Protection Publications of the International Fire Service Training Association and has served on various technical validation committees as well as a current Executive Board Member and chairing the technical committee for the Fire Inspection and Code Enforcement manual re-write for the 8th Edition. Brett currently serves on the NFPA Technical Committees for 1031 Professional Qualifications for Fire Inspector and Plan Examiner, 1037 Professional Qualifications for Fire Marshal, and 1730 Standard on Organization and Deployment of Code Enforcement, Plan Review, Fire Investigation, and Public Education Operations to the Public. Fire Marshal Lacey is co-author of two Fire Protection Publication text books, "Fire Prevention Applications" and "Fire Prevention Applications for the Company Officer," and has co-authored articles for Firehouse magazine and Fire Journal. He has served on the Colorado Fire Marshal’s Association Code Committee, as well as various other state committees. .
Beth Conklin has worked for the Colorado Springs Fire Department since 1989. She started as an office clerk and steadily progressed to her current position of Fire Administrative Services Manager. As the manager for the Colorado Springs Fire Department's Fiscal, Planning and Analysis Division, she is responsible for the budget, accounting, grants management, strategic planning, and analysis functions of the department, as well as oversight of the ambulance service contract for the City of Colorado Springs. Beth served as Finance Section Chief during several disasters, including the CSFD team deployment to Hurricane Katrina, the Waldo Canyon Fire, and the Black Forest Fire. She completed leadership training at the Center for Creative Leadership and has been involved with several large projects for the City, including the Essential Services modeling, PeopleSoft implementation, and Strategic Leadership Team initiatives. Beth holds a Bachelor of Science degree in Finance from the University of Colorado at Colorado Springs. Beth enjoys spending time with her family and friends, golfing, hiking, and volunteering with her church. Angela Hines has served in the role of Fire Human Resources Manager since January 2013. She has oversight of all human resources functions for the department which include payroll, recruitment, hiring and promotional processes, compensation/benefits, and employee relations. She works with a team of three awesome HR professionals who provide support to over 500 employees. Angela has over 16 years of HR management experience and worked in the Biotech and Public Health fields in Santa Fe, NM, before returning to her hometown of Colorado Springs. 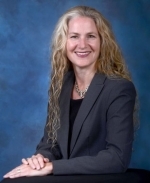 She holds a Bachelor of Arts Degree in Sociology from Colorado College and an Associate’s Degree in Paralegal Studies from Santa Fe Community College. Angela’s favorite thing about working for the fire department is the people, and she enjoys sharing meals with station crews or throwing pizza parties for civilian personnel.